Grand Rapids, Mich. Mar. 19, 2015, Ford Field/DLI Properties – The home of Michigan’s Detroit Lions join alongside others including Amway, Steelcase, Spectrum Hospital, Bronson Hospital, Wayne State University, Western Michigan University, Frederick Meijer Garden and more in the energy reduction war of commercial buildings for 2015. Buildings of all sizes may join the Battle of the Buildings competition now until March 31, 2015. 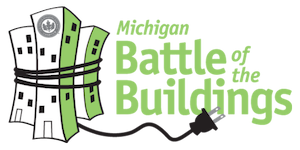 The statewide competition is an expansion of the Battle of the Buildings that started in West Michigan last year and has doubled its participation with over 21,000,000 ft2 and more than100 buildings registered to date. Battle of the Buildings is an awards and recognition program for energy use reduction. The competition is a way to encourage energy-efficient practices in buildings across the state of Michigan and to instill a spirit of friendly competition among the area’s building owners and operators. Participants will measure, track and report their monthly energy consumption using Portfolio Manager, the Environmental Protection Agency’s (EPA) online energy tracking tool. To cut energy waste, participants will engage in a variety of energy-saving activities such as making improvements to the building, optimizing operations and maintenance, and engaging occupants to save. Events are held during the year on ways to save energy, finance projects and improve technology. “The buildings are separated into categories, based on industry type and the ones that demonstrate the greatest percentage‐based reduction in EUI (energy use intensity) during the competition will be recognized at the 2016 energy summit.” says Cheri Holman, Executive Director of the USGBCWM. This summit will include national speakers, panel discussions of participants, exhibitor booths and an awards ceremony. The Energy Summit celebrating the 2014 competition year will be held on Earth Day, April 22, 2015 at the Amway Grand Plaza Hotel, Grand Rapids MI. A full day event featuring Valerie Brader, Senior Strategy Officer to Governor Rick Snyder and Tom Kiser aka: America’s Energy Coach, Worthington Energy along with panel discussions from Michigan Battle of the Building competitors, Vincent Martinez, Director of Operations, Architecture 2030 and others. In 2014, a total building sq. footage of 11.4 million competed, equaling 198 football fields.